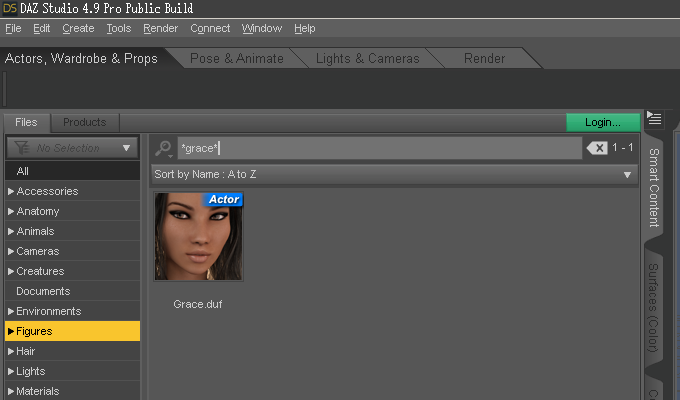 Included with Daz Studio is a script named Update and Merge Menus. Please try running that script and then try again. Important: Do not run that script from a menu. Yeah, ran it from the content folder and not the drop-down menu, and the only thing it did was switch around menu items, and did not restore snap functions, which has been standard since vers 1! No, I had to reconfigure my layout via DS 4.9.0 Beta and save the layout, and import it using 4.9.2, thanks anyway for the suggestion, but it appears to be broken as it's actually an anti-feature in opposition to DS otherwise superior GUI! Seriously, that is one of many features that draws me towards DS, and if they were not virtual, several of my 3D programs would actually be gathering dust right now! Use the Nvidia control panel applet and check the amount of memory the card is using, fan speed and temperature...that kind of problem sounds 'physical'. I think that may be a texture issue; I had a small scene that caused my 980ti to go tilt like that. If I canceled the render soon enough everything cleared up OK. If I waited too long Studio locked up. I have my monitor on a second card, so I didn't loose the system. Try swapping textures and see what happens. I went to play with the diffuse overlay options for Iray Uber, but only "Diffuse Overlay Weight" is visible, Color/Roughness are hidden by default regardless of the Base Mixing mode. Setting a base and overlay color with an alpha in the overlay weight does nothing. Am I missing something here? Oh, I didn't even touch the slider. thanks! I'm having problems with the scalling issue in 4.9.2. I tried to apply the fix specified by DAZ Spooky but the compatibility tab won't let me change it! The tick box is greyed out. Without this change, the right hand half of the content library tab is missing. Since I rely on the content tab, this is a major problem. I'm running Windows 7. Any suggestions? Uncheck the compatibility for Windows 7 option to get access to the individual controls, I think. This makes no difference, alas, The only thing that does is changing the font size settings in the Windows control panel to the default 100%. 4.9.2. then works fine but the font size on everything else becomes eye-strainingly small. I have now set the font size back to 125% and this appears to have fixed the problem, which is a trifle perverse but then this is Windows we're dealling with. Thank you for your support. Glad it's working (for) now. No problem prior to installing the new Studio version, other than running out out card memory with gpu - although its an old pc that may be on its way out so it may be hardware issue so I'll try your suggestion. "WARNING: libpng warning: iCCP: known incorrect sRGB profile" in the log files. Here's a good one I just came across looking at another 'difficulty'. What happened to the smart tab search thing? I typed in the letter 'g' and I should have a lot more then nothing for that search. I tried to change the letter to 'v' and it crashed. What is going on with this? will find everything begining with g. I can't guess what caused the crash. will find everything beginning with g. I can't guess what caused the crash. That is very odd then. In 4.8 when I type 'g' there, the smart tab drops to just ones with 'g' in the name, and I get a drop-down list of suggestions just under the search-box. 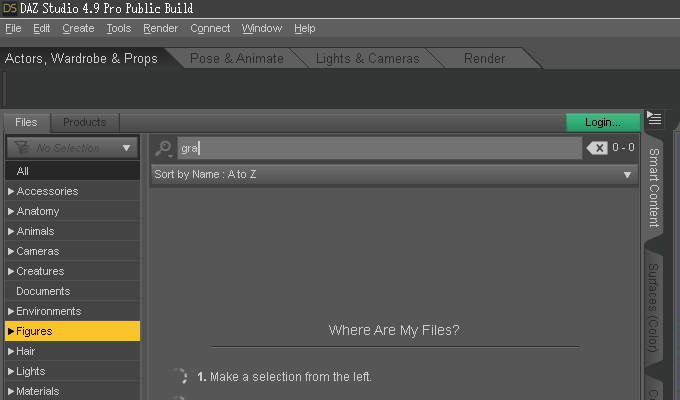 I will give the more complicated method a try in 4.9 after the current render in progress is finished. The crash is a tad odd as well, I have no clue what that is about and may be unrelated. I had just finished wiping and re-downloading two figures over in DIM, and DIM may not have finished closing down before I fired up studio, it's a remote possibility. No list of suggestions, etc. That is a few steps back from 4.8 if that is how it is 'intended' to work, lol. Hmmm, I'm not sure what to make of that, lol. 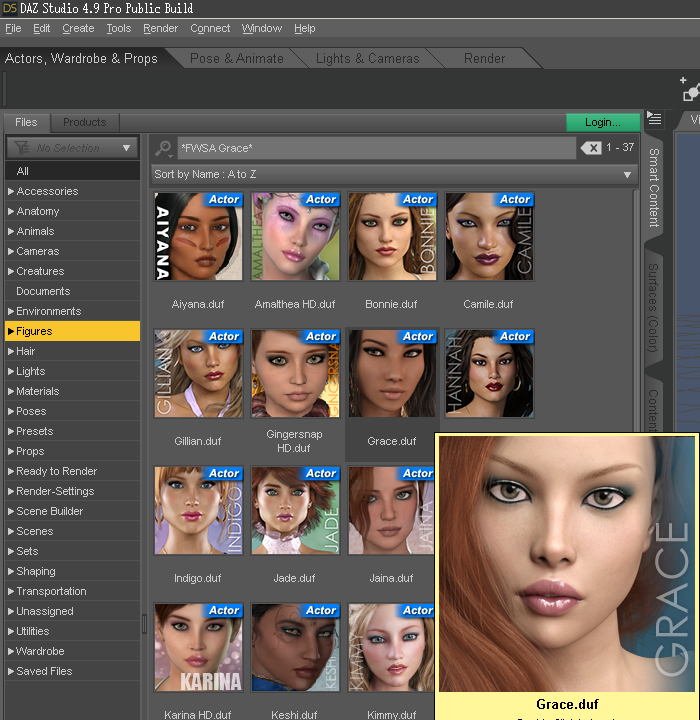 Not the duplicate Grace's (there working on that), the rest of the list in the smart tab. Thanks Cris Palomino, and the use of just the letter 'g' was a pore example, tho the lack of the drop down list is quite missed. It was just nice to be able to just type in a few letters (say "wa" for example) to get to "Wachiwi" without needing to type out the full name. Especially with my difficulty remembering the exact spelling of some names. Without that drop-down list as the name is being typed, some names are going to be akin to cruel and unusual punishment to figure out how it's spelled. Yea, case and point, what did I spell wrong... Google, help! OK, Google is not being much help, I'm guessing I did spell that correctly 'Faylin'? There should be four of them for G2F, Spring, Summer, Autumn and Winter. They came with a bundle with a cool outfit with butterfly wings, I think possibly with a similar name. OK, at least daz did not Nerf the search thing in the shaping tab (yet?). 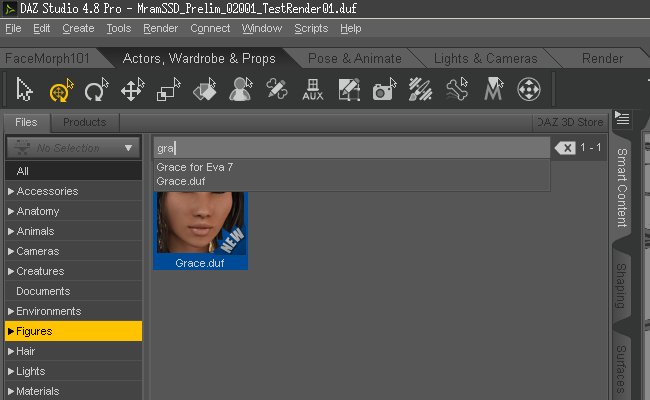 So provided the PA gave you an actual 'Dial' for the figure (not just an On/Off only duf thing), and you have the genesis for that generation already loaded into the scene, there is a way to figure out the spelling of some figures with tricky names. Not faelin, failin, faylin, etc. it just needed another 'n' to actual give me a hint that I had started to typed it correctly. The demand on the CPU is a good point Chris, so I'm not sure what a good solution is for the smart tab. Obviously it will require a new workflow in the end. So I cannot guarantee this will work with 4.9, but in 4.8 and below if you just click on any of the picture icons in the Figures section, and then hit a single key on the keyboard, e.g. F, it goes straight to the first icon whose name begins with F - and then if you carry on hitting F it will step thru all the F's. This is a basic funcrtionality which also works in the Content Library Products listing. Doesn't this work anymore? If it does, no need to use the search box! 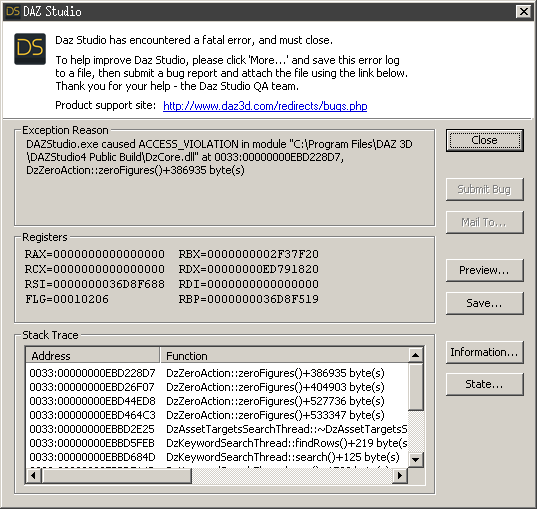 If you have yet to upgrade, Make a copy of the Daz Studio Zip (and the dsx file) in the DIM zip-cache folder (assuming you haven't already). Once you upgrade, the old version is gone forever and you can't get it back without a copy of that zip saved elsewhere. DIM will replace the old Studio zip with the new version in that cache folder. The zip will start with "IM00013176". wow, dynamic clothing has been around since the dawn of time lol, or at least Victoria 4 days. 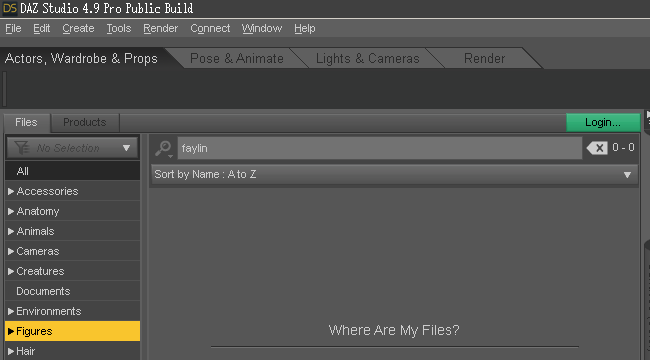 So I am surprised that 4.9 is that much of an add-on crippler for the older Studio 4.8. I've avoided just clicking random icons in the smart tab and using the keys (page-up/down, etc), as simply highlighting an item will mark it as 'not new'. It kind of helps me keep track of stuff I've yet to look at after a big order. The type in a letter with a file selected thing had been around in file managers going back to win95 (possibly win3.11, tho I don't remember for sure), I just never thought to try that in the smart tab before. It dose work in 4.9.2 Public Build. I'm not leaving 4.8 64bit or 4.6 32bit for the scrap bin just yet. I am fussing around in the Public Build, and that lets me keep 4.8 for normal use for the time being. I see the "filter by context" box is clicked at the bottom - do you think that may have made the difference? That you don't have any figures with 'g' for whatever it is you have selected in the scene? uninstalling this release and going back to 4.9.1.30 for a while. There was nothing to the right worth screen-cap-ing, would it realy make that much of a differance? I really don't know. 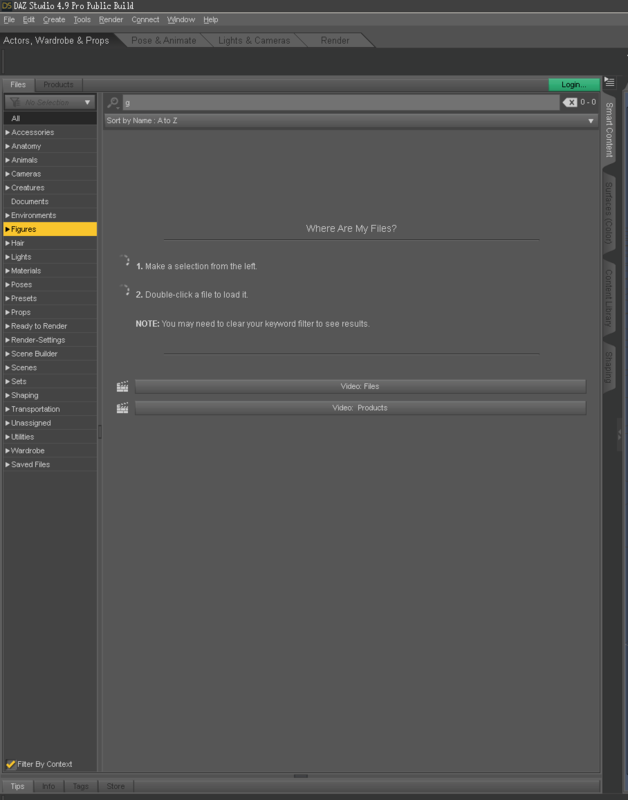 But if I check the 'filter by context' box, and I actually have nothing loaded, I notice that a few of the items in the list on the left disappear. I just thought it worth mentioning in case that was causing your issue with no 'g' products appearing. No, they changed how the entire search thing works for good reasons, so now you don't get any results till you have finished typing in the entire name (full, complete, and correctly spelled). So my habit of typing in a few letters for names I'm not sure of the exact spelling of the entire name, no longer works. It's good for keeping the smart tab from flickering when it is first opened (like it dose in 4.8), it's just not as friendly to use, lol.